On 15th March 2019, The Lord Provost of Aberdeen, Barney Crockett, signed a twinning agreement between the cities of Aberdeen in Scotland and Georgetown in Guyana. The forging of links between the two territories will no doubt help to deepen and expand the on-going work between Aberdeen University, Edinburgh Heriot-Watt University and the University of Guyana to establish an oil and gas faculty in the country. This twinning may appear on the surface to be an unique one, yet we need only reflect on Guyanese surnames like Fraser or MacPherson, buildings like St Andrew’s Kirk, or place names like Rosehall, Inverness or Fyrish to be reminded of Scotland’s historically inextricable relationship with Guyana. 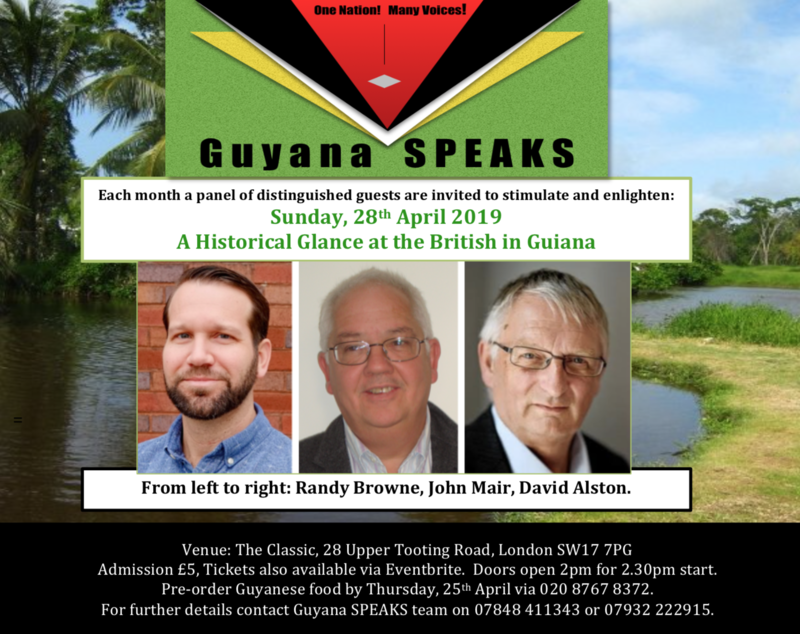 In reflecting on this Guyana SPEAKS have decided to host “A historical glance at the British in Guiana” and invite the following distinguished guests to speak on their specialist knowledge in the field: the historians, Dr Randy Browne and Dr David Alston, and the well known BG-born journalist, author and editor, Mr John Mair. You are reminded to contact The Classic before 8pm on Thursday, 25th April to pre-order Guyanese snacks (Email: info@theclassic.uk / Tel: 020 8767 8372). Meantime, please also circulate this information to your friends and family. Randy M. Browne is Associate Professor of Black Atlantic and African Diaspora History at Xavier University in Cincinnati, Ohio, and a specialist on slavery and colonialism in the Caribbean, especially Guyana. His scholarship has appeared in journals such as the William and Mary Quarterly, the New West Indian Guide, and Slavery & Abolition. He is currently working on several projects, including a study of slave drivers in the eighteenth- and nineteenth-century Caribbean. His first book, Surviving Slavery in the British Caribbean, was published by the University of Pennsylvania Press in 2017 and won the Ohio Academy of History Publication Award. This book’s focus on Berbice, as one of the only places in the Anglo-Atlantic world where enslaved people had access to legal intermediaries, will form the basis of Randy’s talk. Randy will be joining Guyana SPEAKS via Skype. John Mair was born in British Guiana. He attended Sacred Heart RC School and won the Demerara Scholarship (top in the Colony) in 1961. His family then migrated to the UK. John attended the LSE, the University of Sussex and the University of Leeds. He has worked as a producer for the BBC, ITV, Channel Four and GTV in Guyana. In recent years, he has edited 25 books on journalism; the latest two (‘VS Naipaul: the Legacy’ and ‘Anti-Social Media?’) were published in October 2018. He also co-edited the 2019 publication, ‘Oil Dorado? Guyana’s Black Gold’ (2019). John will speak on the topic of his great, great, great grandfather, Sir Henry Clementson, a 19th century planter and proprietor of Cummings Lodge. The Guyana SPEAKS team look forward to seeing you!